As the 2012 Presidential Election cycle draws to a close lets take a look back to see the way forward. Back during 2008 there was a prevalent and funny meme going around comparing John McCain, "The Maverick" to Sigma, the leader of the Maverick robots in Megaman X, and comparing Barack Obama to Megaman X, the Maverick Hunter. According to the metaphor, the Mega Man X plotline followed and Sigma was defeated. But to what end? To continue this metaphor we will need to flash forward to the future in the Megaman Zero timeline. In this timeline Zero, Megaman X's friend and partner, awakens from a long slumber to find that Neo Arcadia is ruled by a tyrant - a tyrant named X, his former partner. X has been trying to eradicate other robots because of "energy shortages", passing draconian measures and even eliminating "terrorists" via the Four Guardians that enforce X's commands. Zero encounters the last band of resisters and takes up their cause of overthrowing X and his regime. But it is revealed the X is in fact a copy of the original with none of the same thoughts and experiences, this Copy X is in fact an imposter created to replace X when he sacrificed himself in the Elf Wars. This Copy X is as completely different in character to the original X as the Candidate Obama is to President Obama. Conversely the spirit form of the Original X, humble, unassuming, and adverse to violence, represents Obama and the Progressive's genuine and intense desires to end the undeclared foreign wars, to stop the rising debt, to end the drug war, adhere to the Bill of Rights, and many other things sold down the river and largely forgotten when Copy X / Post-Election Obama assumed control. Obama has become Bush in the same sense that Copy X became the Sigma that X destroyed. Dr. Weil, the central villain, represents not a figure but the ideas that remain the same from President to President, Congress to Congress, that creep into the brains of those holding office. In the story Weil manipulated Copy X as his puppet. This fits all the more because in the MMZ plot line Dr. Weil essentially can't die, he was equipped with rapid DNA restructuring for a court delivered punishment of living forever in exile. Consequently the ideas of executive authority seem to perist on in every spectrum of time past and present. We can hope that the future does not hold such dark promise. Zero and the Resistance on the otherhand represents, not just Ron Paul in a narrow electoral metaphor, but symbolize the newly reinvigorated Liberty Movement- the only real alternative to the Bush/Obama/Romney war and debt slavery machine. After all it's not Left vs Right, it's the State vs you. Zero is really one of the only characters who struggles not for his own gain, but simply to discover what his place in the world is and to defend those who are unjustly under attack. He doesn't seek power and control like Weil. He isn't trying to prove that he is something that he is not, like Copy X. He doesn't have the lofty political ambitions of Elipszo. Zero doesn't want to be a Gentle Judge that metes out the State's "Justice". Nor does he thirst to deliver punishment to his enemies like Harpuia of the Four Guardians. No, Zero doesn't want any of those things. Neither do libertarians. Like Zero they really just want to live in peace, but when a force threatens that peace and all that they care about then they will rise to the challenge. 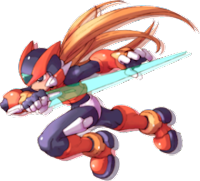 Zero once said, "I never cared about justice, and I don't recall ever calling myself a hero... I have always only fought for the people I believe in." I can't help but be reminded of a certain doctor who ran for Congress because he saw a storm gathering and united a resistance movement to tear down the illegal edifices of a growing police state. "There is a revolution going on ... and I am just lucky enough to be a part of it."